Many people enjoy seeing deer in their garden. If you have vegetation that deer like and you live in or near deer habitat, these elegant wild creatures will frequent your property. The easiest way to live among deer and preserve your landscaping is to choose plants that deer don’t like, although deer may eat even some of those plants if they are hungry enough. If your garden consists of vegetation that attracts deer and deer are around, you can expect them to browse in it. In addition to choosing plants that deer don’t like, most troubling situations with deer in your garden can be prevented by installing fencing and/or using repellents. Fencing works best if you have heavy unwanted foraging by deer. Repellents may suffice if the unwanted foraging is low to moderate. 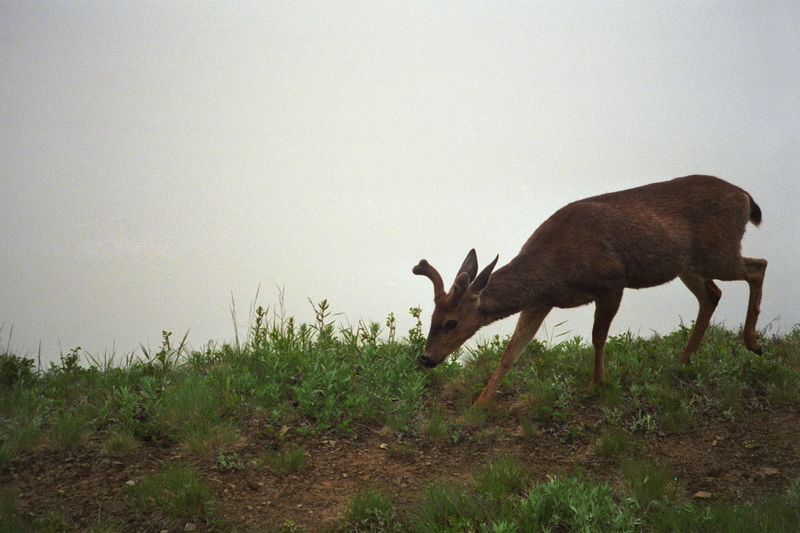 Keep in mind that food preferences of deer vary according to geographical area, season, and availability of food. If a portion of your landscaping contains plants that deer find tasty, you may need to protect that particular part of your landscape. Consult the Sunset Western Garden Book, a garden book appropriate for your geographical area, or your local nursery for a detailed list of deer-resistant plants. Garden stores and your local Cooperative Extension Service may also know what plants are resistant to deer in your area. Each county in the United States has an Extension Office staffed with agents who work with university-based Extension specialists to answer questions about gardening, agriculture, and pest control. Find the phone number of the Extension office in your county in the local government section of your telephone directory or here. A former coordinator for the Master Gardener Program in the San Francisco Bay Area says that deer won’t touch plants in the mint and lavender families. If you want to keep a specific section of your garden or certain trees completely off limits to deer, erect a deer-proof small gauge woven wire or solid wooden fence at least 8-10 feet high around it. The fence will last for many years and be worth the initial expense. You may wish to bury an additional 6-12 inches of the fence underground to prevent fawns from crawling underneath and to keep out other animals who might dig under it. Make sure that there are no openings in the fence. One desperate resident reported that a doe had cleared the top of his fence, which was less than 8 feet. Her fawn tried to follow her by squeezing through a small opening near the ground. Once the fawn’s head was through the opening, the fawn became stuck. Never install a wrought iron fence with spikes on top. Deer can become impaled on the spikes when trying to clear the fence. Wrought iron fences, even without spikes, can be hazardous to fawns. When fawns are small, they can slip easily through the openings. As they grow larger they are still able to compress their rib cages and squeeze through the 5 or 6-inch gaps in wrought iron fences but are stopped by their hips. When they try to back up, their rib cage expands and locks them in place. Stop fawns from passing through a wrought iron fence by tacking attractive 3-foot high small gauge wire mesh that is the same color as the wrought iron onto the lower part of an 8-10 foot wrought iron fence. You may wish to use non-toxic deer repellents with a smell or taste that is offensive to deer. In order to be effective, repellents need to be applied regularly every 3-4 weeks, after rains, and on new growth as the plants grow. The Humane Society of the United States advises that repellents with putrid odors such as the sulphur-based odor of rotten eggs seem to be more successful than taste-based repellents. Various combinations of both aversive tastes and odors have proven to be effective. One very simple, odoriferous repellent is a bar of Irish Spring Soap. Leave the wrapper on and drill a hole through the center of each bar. Run a string through the hole in each bar. Then hang each individual string with its bar of soap on bushes and trees 3 feet apart up to a height of 6 feet. You can also shred Irish Spring Soap and scatter it throughout your garden. Mesh bags filled with fresh garlic can also be hung from trees. Some commercial deer repellents are available from the Humane Society of the United States. Motion-activated sprinklers that squirt water can also discourage deer. A motion-activated sprinkler such as ScareCrow or Spray Away can be found in hardware stores or on the Internet. The sprinkler attaches to a hose, and when deer or other wildlife pass by it emits forceful squirts of water. The most active browse times for deer are early morning, dusk into evening, and moonlit nights. Activate the sprinkler only during the hours that deer frequent the garden. Otherwise, people, birds, pets, and other wildlife passing by will be sprayed. Plastic “bird netting” that is advertised as a bird repellent is not recommended to repel either deer or birds. Animals can become tangled in bird netting that is placed over trees and plants. It is difficult to free terrified skunks, raccoons, birds, and other wildlife that can get caught in bird netting. If you come upon uninjured fawns do not touch them. Their mother is probably browsing nearby. Uninjured fawns lying flat in the grass may be following their instinct to hide from predators while they wait for their mother to return. Unless fawns are in obvious danger, leave them alone and go away so their mother will feel it is safe to return. Strategies to repel deer tend to be most successful if they are used when deer damage first occurs. Implementing several tactics at the same time may also be more successful than trying just one at a time. Folks who live in deer habitat can enjoy visits from deer if they share some of their vegetation with them and protect the plants they value most. If you have additional questions concerning deer in your garden, contact your local wildlife rehabilitation center. To find a local wildlife rehabilitation center visit the list of rehabilitation centers by state or consult Living With Wildlife by Diana Landau et al, Sierra Club Books..
An abundance of deer in some residential areas and parks has prompted some communities to consider primitive ways of killing deer, such as shooting deer, or allowing volunteer bow hunters access to the deer. Those who are opposed to these inhumane methods object to the suffering and painful, lingering death the methods often cause the deer, the fawns who are orphaned when their mothers are killed, and the potential danger the methods can pose to nearby humans and pets. In the end, killing deer with bullets, arrows, or other methods only temporarily reduces the number of deer until the population builds up again, and the situation continues as before. The HSUS has researched non-lethal methods that reduce deer populations. Its Deer Conflict Management and Coexistence Plan (DCMC Plan) provides communities troubled by deer a comprehensive guide to achieving lasting and effective non-lethal solutions. The Plan’s advice is distilled from scientific and peer-reviewed articles, from experts in the field of human-deer conflict resolutions, and from successful deer conflict management models across the United States. The goal of the DCMC Plan is to promote tolerance for the presence of deer and enable harmonious co-existence with them. The plan requires support from the community and depends strongly on the agreement of the community’s leaders. Often it is a Homeowners’ Association, Property Owners Association, or City Council that contacts HSUS for assistance. If there is sufficient community support, HSUS scientist Stephanie Boyles Griffin and HSUS wildlife expert John Griffin can guide a community in implementing a non-lethal approach. In addition, they can suggest ways for communities to keep the implementation affordable. Communities grappling with a very high population of deer and the often strident controversy that accompanies the situation need to know that they have effective non-lethal options. Communities may also contact HSUS to discuss conducting a pilot project for deer management and coexistence and learn more about options for fertility control of deer. HSUS reports that immunocontraceptives can be used to stabilize and reduce a deer population over time. Contact , HSUS Senior Scientist and Science and Policy Director of Wildlife Protection at the Botstiber Institute for Wildlife Fertility Control: 301-258-3147. Contact , HSUS Director of Urban Wildlife.